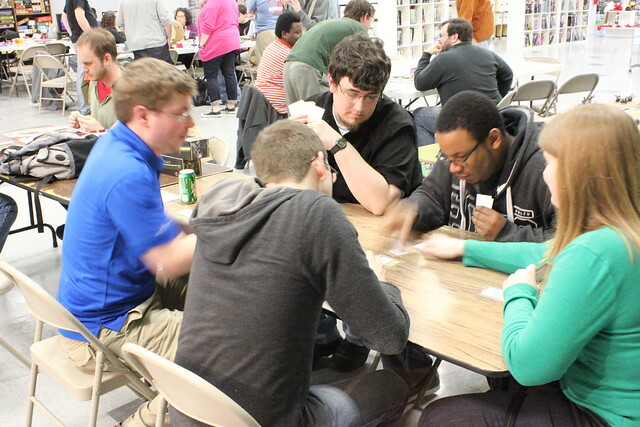 The Unpub Mini at Atomic Empire in Durham was a big success. We had seven designers registered and the whole game room was at full capacity for most of the day. It helped that there was a Netrunner tournament and a 3d printer visiting for the first few hours. Both to brought in lots of walk-through and crossover traffic. Between tournament rounds, we had a lot of gamers coming over for a quick demo or play session. In total, we collected 86 feedback forms from individual playtests. I'm pretty sure we had at least twenty more playtesters in attendance who for whatever reason didn't fill out a feedback form. In terms of numbers of feedback forms, the big winners were Fog of War with 17 forms, Duck Blind with 20 forms, and Havok & Hijinks for with 27 forms. I thought at first that a party game like Havok & Hijinks would be the runaway leader. Short games with lots of players, usually party games, are be able to turn over way more playtests than another genre. Duck Blind compensated by playtesting with large groups and Fog of War had two prototypes running as separate sessions. Hopefully a future event will be even bigger and we can get that form count in the triple digits. More Prototypes for Long Games with Few Players: A few games only got a few feedback forms, which seems a real shame. Next time, I'll encourage more prototypes for games with longer times and fewer players. Maybe I'm overthinking this part of the event, but I found Unpub most useful as a designer when I could rapidly cycle through a high volume of individual playtesters. I'd really like all designers to come away with as much feedback as possible. Get some help: Boy, running even a small event like this for seven hours solo is tough. It helps that John Moller and Car Trunk Entertainment have so many assets readymade for volunteers. That side of things was well taken care of. Where I needed more help was making sure newcomers were greeted while also keeping the playtesters cycling between game sessions. Doing both at once was a real drainer. Phew! Next time, I'm going to need one person to help tag team various duties. Cut it down an hour: We were scheduled from 1-8, but the last hour was pretty quiet. Not much of a Saturday night crowd at Atomic, apparently. If we go from 1-7, that still leaves an hour of "overtime" play to wrap up lingering sessions and gives designers more time to grab dinner before the long drive home. Atomic Empire is a great location: The game room is one of the biggest on the east coast. It's the only game store I've been to with local craft beer on tap. Brilliant! The staff is ultra-helpful and very eager to host another Unpub in the near future. For some, this was the first time visiting Atomic and they were all very impressed. During the event, I ran around to each designer to record Vine videos of their game pitches. Vine has a 6sec limit so it's an ideal constraint to keep your pitch short and snappy. Many thanks to all the designers, attendees, Car Trunk Entertainment and Atomic Empire!